Any news that reflects positively on PDT is naturally ruthlessly suppressed by the media, but the net being the way it is, we nevertheless do tend to find out if these things are of interest. Anyway, seems the June 12 “summit” is still on. Which has brought a different kind of thought to my mind. The premise is that China is the road to influencing the North Koreans. 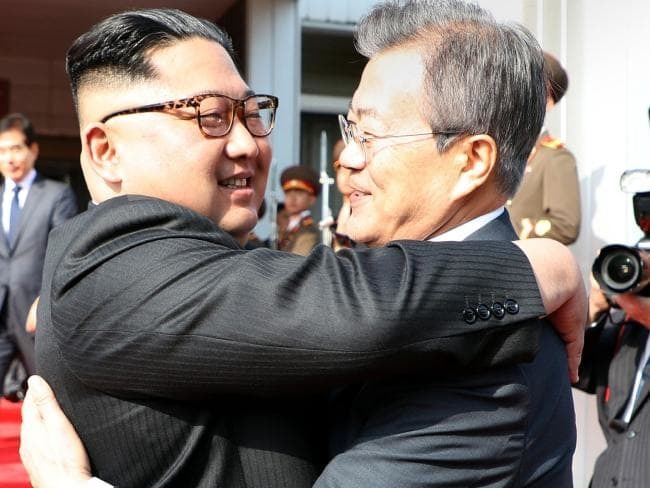 But the way this is unfolding, it may well be that the North Koreans want to be friends not just with the rest of their nation to the south, but with the entire West itself. First look at the picture above and then read this article for yourself and think about what the North Koreans, and even Kim, really want: U.S. team in North Korea for talks on summit, Trump says. Anyway, things seems to be limping towards a peaceful outcome for the first time since 1952. This entry was posted in American politics, International. Bookmark the permalink. 19 Responses to Is North Korea defying China? Nah, Kim’s just nicking Moon’ Samsung with his left hand. Treatment of their own citizens doesn’t support the theory that they just want to be friends with anyone. Nork’s isolationist policy would suit China. Treating your own citizens like dirt would be the Maoist model. The Ruskis are also reportedly offering the Norks increased intarweb, so that must curtail isolationism, also. Or maybe Kim Il Fatso has realised that a permanent state of Cold War is not the path to implementing a one world government. Tear down the wall then subvert its institions with sleeper agents. Its working well so far. The better interpretation is that Kim has always been Washington’s man on the peninsula. More observant Cats will notice that whenever Chinese troops start massing on the border, Kimbo fires a few skyrockets into the drink, makes some statements about being mad as hell, and not going to take it anymore, and voila, the Seventh Fleet shows up off Korea. Nemkat is nothing if not a laugh. I’m starting to warm to nemkat. Need a good chuckle in the morning. “Eagle Hits Dragon With $50 Billion Interference Penalty…” at CTH. Betteridge’s law applies there I reckon. The entire Norko politbureau deserve to be executed for crimes against humanity, starting with fatboy. Russia and the US trying to break China’s isolation of the Norks? The same could be said of the Chinese leadership. However, if you wan to deal with China, you have to deal with the leadership. China has exerted none of its supposed influence on Nokor to improve the lot of the people there. It was only interested in NoKor as a brick in the cordon sanitaire it wanted to build. Pyongyang is a ruthless dictatorship that is occupied solely with regime maintenance. Trump is about to provide a propaganda coup. Far better that he left the public displays to Moon, since his pictures with Kim are difficult to spin for domestic benefit. I fear Trump has been played and the Chinese will take a slice of his bottom. Seems to me the game is to seduce NK from being China’s attack dog against the West. Why would Kim want to live the life he does now, as China’s beast, when he could have fun instead? Actually, let’s go a step further: North Korea is what a country looks like when it allows itself to be governed by China. South Korea is what a country looks like when it allies itself with the West. My take is that PDT, not particularly caring what the media say, has thrown NK a face-saving bone by letting Kim be the “hero” who “saves” the talks. That way, he(Kim) is more inclined to be generous at the negotiating table. As a bonus, it is also showing that PDT won’t accept crap from NK anymore than NK will accept crap from the USA – something that has been sorely missing for the last 50 years. The NKs are ire irrelevant if talk of the talks stop. That is their only interest. They don’t want to save the talks. Just talk about them. What the government spends more, the public spends less. Public works are not accomplished by the miraculous power of a magic wand. They are paid for by funds taken away from the citizens. Entropy on Is North Korea defying China?